Americlock is pleased to offer a solar-power clock, which is the first of its kind. You can power up to four 6’ clocks using our low-voltage clock controller. This clock controller will reset for daylight savings as well as drops in power. 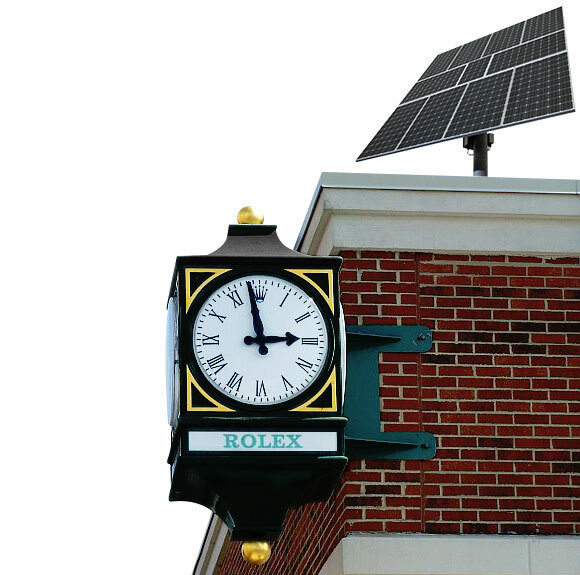 The solar-power clock is ideal for LEED-certified projects as well as projects where power is not easily available like golf courses or monuments. Solar power also cuts down on the electrical installation costs since only low voltage wiring is needed. In many applications it is more cost effective to use a solar-power system than to use conventional electrically powered clocks systems.